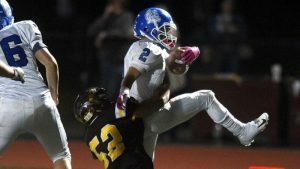 Jeff Kology and his Stafford/East Windsor/Somers teammates orchestrated a memorable turnaround. Brad Horrigan – Hartford Courant. Sometimes when putting together a new Linked Up, I pause for a moment and sit in awe of all the great coverage provided for high school sports in Connecticut. Today was one of those days. So much good stuff here with stories on team turnarounds, seniors making the most of their final seasons, coaches reaching milestones and more. Check it out. From the Hartford Courant: Charting the remarkable turnaround of the Stafford football program. From CThshockey.org: The latest installment of the great Players Tribune feature this time from former Amity goalkeeper Tyler Johnston. From the Danbury News Times: Legendary Danbury girls basketball coach Jackie DiNardo keeps track of all the important numbers, not just wins. From the Manchester Journal Inquirer: South Windsor girls volleyball coach Tina Holt carried her legacy into her final season. From the Norwich Bulletin: It might not always start this way, but usually its her performance that gets attention for NFA wrestler Savannah Vanase. From CT Sports Now: Foran wrestling coach David Esposito gets his turn in the CT Sports Now Coach’s Spotlight. From the Waterbury Republican American: A pair of longtime Beacon Falls teammates are helping Notre Dame-West Haven to a big season. From the Meriden Record Journal: In a family that knows football, Southington grad Alexandra Barmore is pursuing her football dreams. From The Day of New London: Some bold and creative decisions have helped bring added exposure to the ECC. From the Connecticut Post: A big group of seniors are powering a strong season for Trumbull girls basketball. From Litchfieldcountysports.com: Former Thomaston standout Casey Carangelo has endured a slew of injuries but isn’t giving up hope. From the Waterbury Republican American: Still in its historical infancy, the Nonnewaug swimming program is making steady progress. From the New Britain Herald: The New Britain boys basketball team is rounding into form with the postseason approaching. From Sports Team 8: A pair of former Connecticut high school hoopsters are making an impact in college for LIU. From Shore Publishing: Senior captain Sophia Araneo is making the most of her senior season for Branford girls basketball. From TheRudenReport.com: Checking in on the FCIAC boys basketball season roughly half-way through the campaign. From the Middletown Press: A long football journey has former Connecticut standout John Sullivan heading to the Super Bowl. From the Stamford Advocate: Depth at the top has been the story of the season in SWC girls basketball.